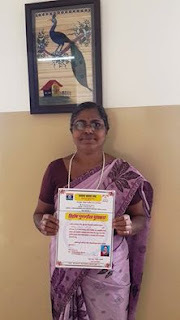 26-September-2016 (Mumbai): Mrs Ranjana Gangurde, a senior social worker from the Don Bosco Development Society (DBDS) Matunga; has been awarded “Exemplary Work Recognition Award” by Samaj Samatha Sangh (SSS) Mazgaon, Mumbai. Mr Kishore Gajabhiye (Retired IAS Officer & the President of SSS) who presided over the 89th anniversary function of its organization’s existence handed over the award to her. The function was held at Tardeo (Mumbai); in which SSS felicitated a few selected activist who have contributed significantly towards the upliftment of the people residing in the slums. Since 2001, DBDS has been actively working in Reay Road, Dockyard Road and Mazgaon. DBDS has worked on issues of Women Empowerment, Right to Education and food, Water & Sanitation and number of other issues. Ranjana Gangurde has been actively working in this area and hence she was rightly chosen and bestowed with this award. It is a moment of great joy for DBDS as its now being recognized for its contribution in social field in the city of Mumbai. “I feel so over-joyed on receiving this award – I thank Don Bosco for this opportunity. I am grateful to Fr Rolvin, our Executive Director for his support too,” said Ranjana at the time of felicitation in the office.